My family always runs the Turkey Trot road race on Thanksgiving morning. This is our 15th year; it has become a family tradition. Our daughter had to miss it this year, though, because she is a nurse and was scheduled to work. She’ll eat the turkey dinner with the family, though; and that is enough for it to be a happy Thanksgiving. 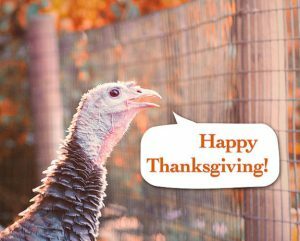 Wishing all my readers a happy and thankful day too! Have a very happy Thanksgiving, Meg! Hi Linda, wishing you a great weekend! A very Happy Thanksgiving, Mag dear. But what chicken is thanking for? Trust you have had a great Thanksgiving with family — having an early morning run takes away some of the guilt of a loaded Thanksgiving plate! Enjoy the rest of the Thanksgiving weekend! Hi Becca, yes, we loaded up our plates and had a great dinner. My mother-in-law makes the yummiest baked potatoes. 🙂 Enjoy your weekend too!